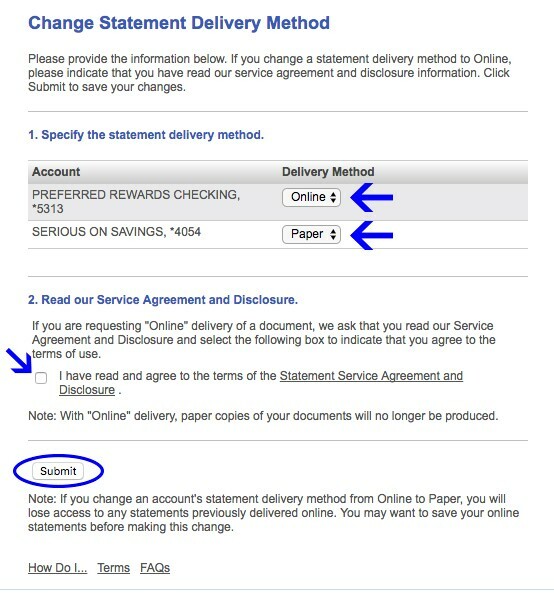 Online statements from Northwestern Bank are the fastest and most secure way to receive your monthly or quarterly statement — and they can be conveniently downloaded or printed when needed. Sign up to go paperless today. It’s the perfect way to save time, stress and the environment — all in one click! 1. Log in to Online Banking. (If you don’t have online banking with NWB, learn more here). 2. Click on Customer Service on the main navigation menu, and under Account Maintenance select Change statement delivery method. 3. On the table that appears, choose your preferred Delivery Method (Online or Paper) from the drop-down menu located next to each of your accounts. If you have any questions, call us at (712) 737-4911 in Orange City or (712) 324-5141 in Sheldon, or contact Northwestern Bank online.